SEOUL, South Korea, March 20, 2019 /PRNewswire/ -- Foresting HQ, a new reward-based lifestyle social media platform developer, today announced about listing its cryptocurrency PTON in the period from 20th to 31st of March on three crypto exchanges: two global and one Korean crypto exchanges. As soon as PTON token is listed, anyone registered on cryptocurrency exchange platforms can quickly and easily trade PTON. This will enhance PTON exposure and allow community to purchase and use PTON. 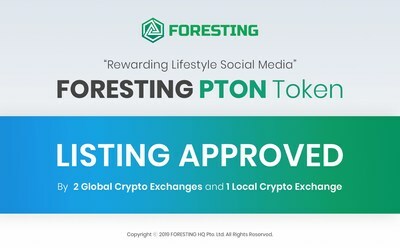 Foresting PTON token is a cryptocurrency used as a tool of user compensation on the FORESTING, reward-based social media platform. FORESTING mission is to provide economic freedom fo content providers. The platform increases the efficiency and impact of content providers by enabling them to generate new content faster than traditional social networks, and creates a new ecosystem for social media through blockchain technology and a new concept of social media token operation. Platform content creators are being rewarded for creating and posting content by other users' liking (BEATing) and donating (SHOOTING). Besides, PTON token can already be used as an offline payment method as well as a mobile coupon purchasing tool, which is to be integrated after platform launch. Thus, it will enhance PTON token ecosystem. According to Foresting HQ, the long-awaited listing of PTON will be on a global crypto exchange, headquartered in Hong Kong, IDCM. The crypto exchange platform provides exchanges in 70 markets and deposits through Wechat and Alipay. In particular, PTON token will be listed on 4 IDCM exchanges such as Hongkong, Singapore, Korea, and Dubai and can be traded in BTC and ETH markets. Moreover, Foresting HQ will host Airdrop event in collaboration with IDCM. Details on how to participate can be found on Foresting official social media pages and IDCM homepage.